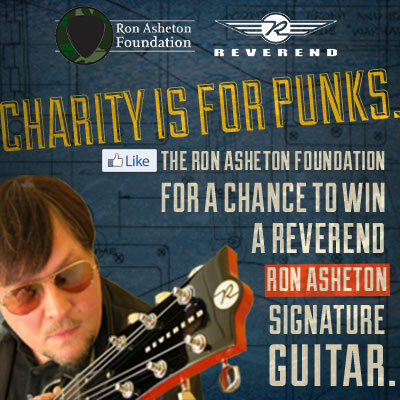 GIVEAWAY: We’re giving away a Reverend Ron Asheton Signature Guitar, once we hit 5000 “Likes” on our Facebook page. All you have to do is “Like” the Ron Asheton Foundation on Facebook page for a chance to Win the Reverend Ron Asheton Signature Guitar. Reverend collaborated with proto-punk guitar legend Ron Asheton (1948-2009) to bring you this unique guitar. Based on our popular Volcano model, this guitar melds three Reverend CP90 pickups with a korina body for a raw, yet fat tone with a percussive attack. The perfect guitar for edgy rock tones, but also versatile enough for just about any situation. Unique features include: lightning bolt body logo, and Ron’s signature silkscreened on the back of the headstock. Special pricing applies for Cinetopia Films: $12 general admission, $9 for DIA members. A percentage of the sales go to the, Ron Asheton Foundation. Reverend Guitars had the honor of working with Ron Asheton on his Reverend Signature Model. Based on our Volcano body, the guitar features three Reverend P-90s and a Rosewood Fret board, and has that edgy rock tone that Asheton used to create a genre. He used it extensively on his world tours with The Stooges in the 2000s. Always available in Rock Orange with a three lightning bolt logo on the front, and his signature on the back, Reverend Guitars is now offering it in Ice White for 2013. Like all Reverends, the Ron Asheton Signature Model has a Korina body for consistency and clarity, pin-lock tuners, and the exclusive Reverend Bass Contour, which adjusts the low frequencies in the same way that the tone control adjusts the highs. Famed materials, select upgrades, and fresh innovations: Reverends are for daring musicians and independent dealers. Recorded live at the Michigan Theater, this heartfelt tribute/celebration of Stooge guitarist Ron Asheton’s life and music featured Iggy and the Stooges, Henry Rollins, and guest guitarist Deniz Tek (Radio Birdman). Includes a string section on a few Stooges classics! All profits from the sale of the DVD go to the Ron Asheton Foundation which supports animal welfare and music. Many of you asked about the tribute show we did for Ronny at the Michigan Theater in Ann Arbor. Great news! The DVD will be available June 4th! We are very proud of the show we put on. It was truly an amazing evening. We can’t thank everyone enough for all of their support and love that made the night so special. The Stooges’ homecoming/tribute concert, April: Around 1,700 people showed up to hear punk rock pioneers Iggy Pop and the Stooges play a benefit concert in honor of their late bandmate Ron Asheton at the Michigan Theater in April. The raw power of Iggy Pop and band provided a double dose of musical nostalgia and solid musicianship, charging through their hits while offering a heartfelt tribute to one of Ann Arbor’s overlooked musical heroes. (One AnnArbor.com writer wrote, “I’ll never forget watching everyone run up on stage. It’s the wildest ‘party’ at the Michigan Theater I’ve ever attended.”) In a remarkable turn, it was the first of a two-part homecoming by the two Ann Arbor-bred acts who have been inducted into the Rock and Roll Hall of Fame. Any musician, or anyone with a love and appreciation for music, understands how important an instrument is to an artist. Here is the first story on the journey of Ronny’s guitars. The Humane Society of Huron Valley held their annual, Purrfect Doggone Golf Scramble September 16th at the Pierce Lake Golf Course in Chelsea Michigan. 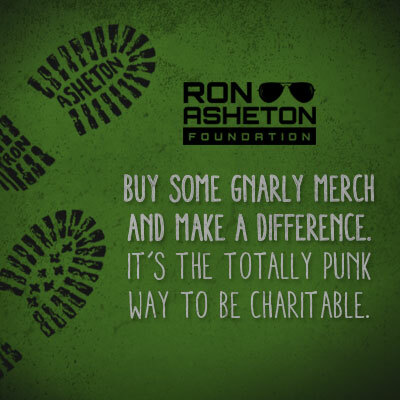 The Ron Asheton foundation was a proud sponsor. Our Team finished in 1st place playing in the co-ed division. Congratulations to Diane, Tom, Brian and Jan!! And thank you Diane Ulin for putting the team together! The Ron Asheton Foundation would like to announce a campaign to promote dog adoption. CDs retail at £20.00 and, if you weren’t lucky enough to be there, CDs can be ordered at www.concertlive.co.uk and delivered directly to your door. Don’t miss out on these fantastic collector’s items. Get yours now!